I would like to know if anybody knows what type or kind of ear buds fit into the LS Audio Plug-in.. The ones I have bought do not fit into the plug-in on the LS.. What do I need to look for? Thanks B.
I believe the audio plug on the LS is more like what you would have with a stereo system. I am not positive, because I have not seen that plug for about a year and a half. I will, however, see if I can look it up. I looked up a picture of that plug in the instruction book. It is not what I thought it was, but looks more like the plug that would be on a small external speaker system a person might use with a CD player, etc. I have sent an email to someone who might know. However, is someone else does know, speak up! 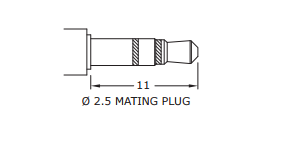 The Audio Output jack on the LS model is a 2.5mm phono jack with an 11mm length, per the below drawing. OK; I got an answer from Meade and it is a 2.5mm phono jack with an 11mm length. I have try to find this on the internet with no luck but I have found a 3.5mm stereo jack adaptor to 2.5mm stereo plug on Amazon for $4.23. So I am going to try it when it come in.. Please let us know if that works, Betty. Thanks for the information! Yes; It does work just fine.. Hope this helps somebody elce, now I can here the monnorator... B. Time and date on LS 8"
At this point, I do not have a clue how to set the date. I tried to look it up in the scopes manual they have on line, but the only thing it shows is setting the time zone. I will check further. The scope is supposed to get time and date from its GPS fix. If it is not able to do that, then it is supposed to ask you for time and date. If it is not able to get the time and date from satellites and does not ask you for it, then there is something wrong. I did not think of it in my reply, but I will ask if this could be a program glitch that has developed in your scope, with the possibility of getting a mini SD card with the newest program on it. If you already have a mini SD card with a copy of the program on it, you can stick it in the slot on the scope before starting up and it should reload the program off the card. If all else fails and the date issue is bothering either you or your scope's performance, then the scope would need to go in to Meade. I will inquire further about the possibility that something went wrong with the code in your machine. Sometimes these things do develop glitches. If there is an issue there is it undoubtedly hardware, not the software.